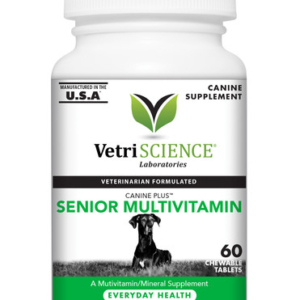 GlycoFlex Everyday chews are recommended as an introductory joint support supplement for pets needing basic support or for those that may be predisposed to joint health issues. 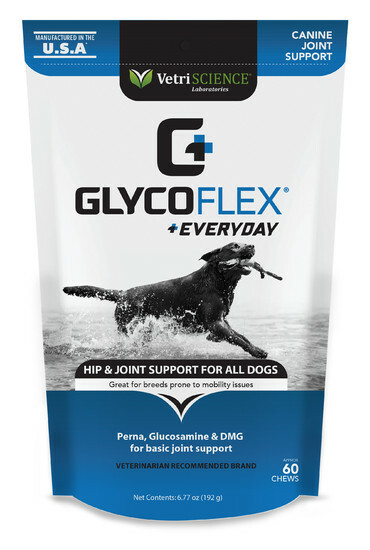 With 600 mg of perna canaliculus, 500 mg of glucosamine and 100 mg of our patented DMG (N,N-Dimetylglycine), GlycoFlex Everyday chews are formulated for a lifetime of healthy joints. Perna is an edible green-lipped mussel from sourced from the waters of New Zealand. 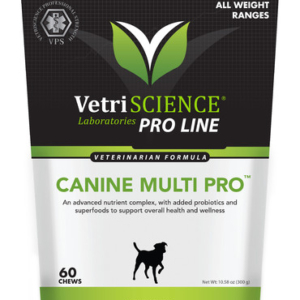 The perna has been freeze-dried so that the whole organism is included, providing many of the nutrients necessary to maintain healthy connective tissue, build healthy cartilage and support normal joint function. It is rich in amino acids, polypeptides, naturally chelated minerals, fatty acids, glycosaminoglycans (GAGs), vitamins, glycoproteins, protein complexes, polysaccharides and the nucleic acids RNA and DNA. Perna contains all major classes of GAGs including chondroitin 4 and 6 sulfates and hyaluronic acid that feed connective tissue such as joint cartilage, tendons, ligaments, and synovial fluids. 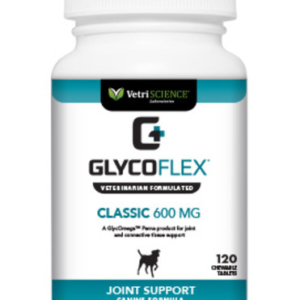 The perna used in GlycoFlex] products is the GlycOmega brand perna canaliculus exclusive to VetriScience Laboratories. The nutrients provided from perna also are known to support other systems in the body including sperm motility, vascular system, bladder function, immune system function, and gut health.